INTRODUCTION TO MAKE AN UNIQUE 3D CONCEPT, IT IS IMPORTANT TO UNDERSTAND THE LANDSCAPES RELATIONSHIP TO CLIMATE AS WELL AS THE DIGITAL TOOLS THAT CAN BRING IT TO LIFE. THIS INTERACTION ENRICHES MY DESIGN PROJECTS BY CREATING EXCLUSIVITY AND EXPLORES THE ART OF STORYTELLING THROUGH IT’S 3D VISUALS. 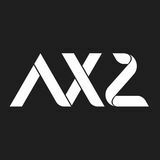 AS AN ARCHITECT AND URBAN PLANNER WITH MORE THAN 10 YEARS OF EXPERIENCE DEDICATED TO THE ARCHVIS INDUSTRY, I BELIEVE IT IS ESSENTIAL TO CREATE MY OWN CONCEPTUAL PROJECTS IN ORDER TO IMPROVE SKILLS. 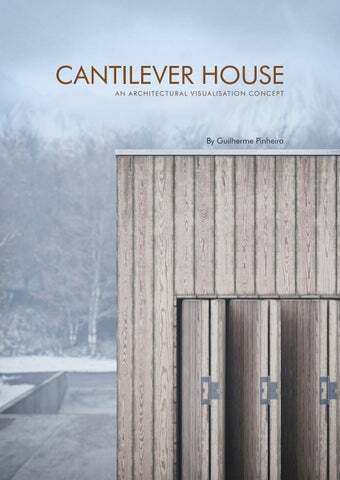 FOR THIS REASON, I’VE CHOSEN TO FULLY DESIGN THE ‘CANTILEVER HOUSE’ FROM CONCEPTUALISATION OF THE EXTERIOR FORMS TO ALL OF INTERIOR DESIGN & STYLING. I ALSO EXPLORED THE PROJECT AS A VIRTUAL PHOTOGRAPHER FINDING OUT THE BEST LIGHTING AND CAMERA COMPOSITIONS. THE ‘CANTILEVER HOUSE’ IS A NON-COMMISSIONED PROJECT DEVELOPED FOR SAINT GALLEN, IN NORTHEASTERN SWITZERLAND, WHERE THE PICTURESQUE ENVIRONMENT MAKES FOR CHALLENGING BUT SELF-PLEASING EXERCISE. ARCHITECTURAL VISUALISATION IS MY PASSION. I’VE CREATED THIS BOOK TO SHOWCASE THE IMAGERY PRODUCED AND INFORM YOU ABOUT THE CONCEPT. I HOPE YOU LIKE IT. ARCHITECTURE SET ATOP A HILL AND OVERLOOKING THE SWISS ALPS, THIS HOUSE READS AS AN ELONGATED GEOMETRIC FORM THAT CONTRASTS AGAINST THE NATURAL LANDSCAPE. THE RELATIONSHIP STARTS FROM THE STREET ENTRY, WITH A TIMBER CLADDED PLINTH CANTILEVERED OVER A SUBMERGED CONCRETE BLOCK BASE, ANNOUNCING MOUNTAIN VIEWS. A MINIMAL DESIGN LOOK HIDES THE INTIMATE LIVING SPACE SECLUDED INTO THE WOODS BRINGING A FEELING OF WARMTH AND COMFORT. 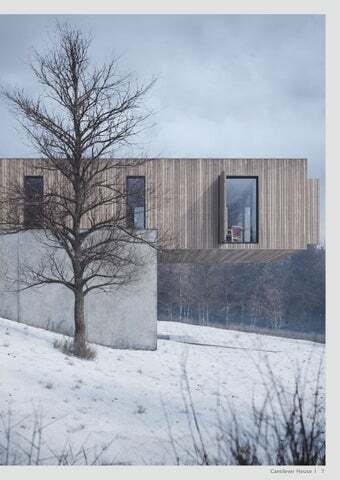 TAKING POSSESSION OF ITS LANDSCAPE AND SETTING AGAINST THE SNOWY SURROUNDING, THE HOUSE IS A DYNAMIC COMPOSITION OF TWO CONCRETED LONG RECTANGULAR FORMS. LANDSCAPE CLIMATIC EXTREME IS EVIDENT ON THIS CONCEPTUAL ENVIRONMENT. DRIED TREES THROUGH A WINTER SEASON ENVELOPES THE SITE LOCATED BETWEEN SNOWY MOUNTAINS. THIS IS A LANDSCAPE OF GREAT DRAMA. THE HOUSE AND ITS PLACEMENT ON THE TERRAIN IS AN ABSTRACTION OF THE CONTEXTUAL HILLY AND COLD SURROUNDS. INTERIOR STYLING BEING CONTEMPORARY AND MINIMAL, THE FURNITURE SELECTION AND DECORATIVE PIECES WERE CHOSEN TO FIT THE DESIGN AS WELL AS MY PERSONAL TASTES. FOLLOWING A DESATURATED COLOUR PALETTE, THE USE OF RAW MATERIALS EMBRACES THE ARCHTECTURAL LANGUAGE AND GIVES A TOUCH OF PERSONALITY AND SOPHISTICATION. ON THE BEDROOM, DETAILS WITH TIMBER TONES AND BRASS ELEMENTS WARM UP THE SPACE, MAKING IT CONFORTABLE AND WELCOMING. TEAMED WITH A MODERN DANISH DESIGNED CHAIR, THE WOOD FLOORING WORKS TO GROUND THE MODERN BROWN LEATHER SOFA ON THE LIVING ROOM. Minimal & Contemporary design house. Open living space secluded into the woods. A fire place, a book... have a relaxing time over the weekend in this cozy retreat.